Welcome home! This condo features a newly updated kitchen with granite counter tops, new backsplash, new appliances and ceramic tile flooring throughout the first floor. There are 3 bedrooms with the master being on the first floor. Upstairs you will find 2 spacious bedrooms with plenty of closet space, and a full bathroom. 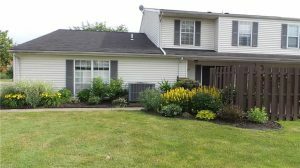 Outside you will find beautiful landscaping with a private deck that is great for entertaining! Brand new carpet installed in bedrooms.